You’d think a tiny nation the size of an average American city would be easy to know at a glance, but Singapore specializes in defying expectations. Home to the world’s best airport, some of Asia’s most stunning architecture and a delicious food scene that borrows from its neighbors’ top culinary traditions, Singapore offers a complete travel experience disproportionate to its size. Expensive? Yes, if you’re an expatriate, but transportation, accommodation, and dining can be cheap for savvy travelers. Too built-up? Parks and nature reserves make up over 40 percent of Singapore’s land area. Oppressive? Hardly; Singapore is a creative center where the laws actually give local artists freer rein to express themselves. First-time visitors to Singapore have a lot of expectations to unpack: Start the process with the info provided below. Singapore's lack of wind and high temperature and humidity can come as a shock to visitors used to cooler climates. Unsurprisingly, air conditioners are commonplace throughout the island; Singapore's late founder Lee Kuan Yew himself famously declared the air conditioner as “one of the signal inventions of history”. Do as the locals do, and avoid walking too long in the outdoors if you can - the air conditioners are there for a reason! Consider the humidity and the occasional monsoon rains when you pack clothes for your Singapore trip. Wear loose and light summer clothing when in town. If you’re traveling on business, smart casual is often accepted, unless you’re attending a formal business dinner. Jackets and ties are still de rigueur for business meetings, with the odd exception here and there. Is It Expensive to Visit? Singapore's first-world status also means high prices in general, compared to travel expenses in the rest of the region. Traveling on a tight budget in Singapore is a little more difficult, but not completely impossible. Holders of US passports are allowed to enter Singapore on a visit pass. Certain limitations apply: you’ll only be allowed into Singapore if your passport is valid for at least six months after arrival, and must show proof of onward or return passage. 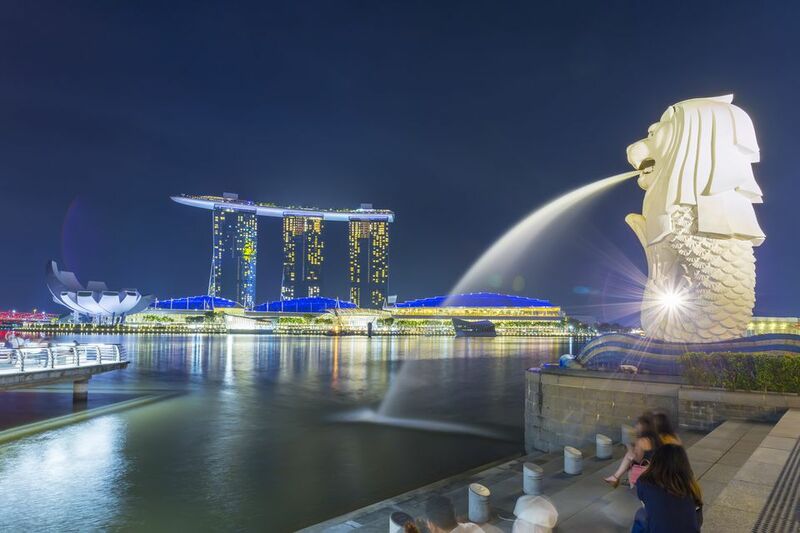 Singapore is one of the easiest countries to travel to, given its central location in Southeast Asia and the abundance of budget airline connections to the rest of the region. Changi Airport isn’t just the international gateway to Singapore, it’s also a major travel hub between Asia and the rest of the world. As befits a first-world country, Singapore is a very safe travel destination, one of the most family-friendly destinations in the region. The government's stringent security measures, first spurred by the ongoing threat of terrorism around Southeast Asia, continues to uphold Singapore's reputation as a safe destination. Singapore's reputation is partly held up by the fact that it has the strictest laws on the books - covering not just drugs, but also vandalism and political activity. Tourists behaving badly in Singapore should expect the law to come down hard on their shenanigans. Drinking alcohol in Singapore is not prohibited, but recent rules have limited the areas where you can drink to your heart's content. Singapore hawker centers have not stopped selling beer, but stalls in Geylang and Little India have stricter rules than usual. Singaporean law shares the draconian attitude to drugs common in Southeast Asia. The country's strict Misuse of Drugs Act punishes possession of even small amounts of illegal drugs and prescribes execution if you're caught with large amounts of controlled substances. Travel within Singapore is fairly easy if you've got the hang of riding the bus and train, particularly if you've got an EZ-Link Card to pay your way through. The EZ-Link card is a contactless payment card that you can purchase (and top up) at any 7-Eleven store, valid at any bus and train on the island. To find out how to get from point A to point B, browse over to GoThere.sg, a site that lets you input your start and end points in plain English, then generates a trip route using both rail and bus grids. For smartphone users, use the Singapore Land Transport Authority's official My Transport Singapore app to figure out the best way between stops. There's a Singapore hotel for every budget, though you should expect that accommodations around here lie on the high end price-wise. For four-star-and-up hotel rooms, check out your options in Marina Bay and Orchard, among them historic hotels like the Raffles Hotel and newfangled wonders like the Marina Bay Sands. Balestier Road, Katong, Joo Chiat, and Little India are better known for their backpacker and budget digs. The territory around Singapore offers a diverse variety of activities that belies the nation’s small size. Singapore’s different, distinct neighborhoods represent different aspects of the national experience: Homelands for different ethnic identities, ancient shops rubbing elbows with hipster outlets (Joo Chiat and Tiong Bahru), hotel and shopping mall hotspots housing the world’s most premium brands (Orchard Road), and a skyline straight out of the Jetsons rising from a former British colonial port (Marina Bay and its landmarks like the Marina Bay Sands and the Singapore Flyer). Tourists of any budget can find plenty to do exploring the city's many shopping malls, filling up in one of Singapore's many hawker centers, or sunning on the beach at the smaller resort island to its south, Sentosa. Are There Parks or Wildlife? Careful stewardship of the island’s real estate has left Singapore with an estimated 47% of parkland, mostly surrounding artificial reservoirs. The Singapore MRT stops right in front of the 74-hectare Singapore Botanic Gardens, the nation’s only UNESCO World Heritage Site. This park was established in 1859, built by British colonizers along the lines of the English Landscape Movement of the time. Today, over 6,500 species of plants cover a beautifully-manicured park area, located only a short distance from the Orchard shopping district. Bigger parks, like the 163-hectare Bukit Timah Nature Reserve and the 202-hectare Sungei Buloh Wetland Reserve, can be found further from the city center. Visit the former for its 25-meter-high TreeTop Walk crossing the forest canopy; visit the latter for its mangroves sheltering a breathtaking variety of migratory birds. Singapore’s a pioneer in the zoo world, with places like the Singapore Zoo, Jurong Bird Park, and Singapore Night Safari offering you a close-up look at some of the world’s most endangered animals, housed in humane open enclosures. Singapore’s social calendar keeps the island interesting year-round, with events like the Chinese New Year and the Formula One weekend. The country shares many of its top festivals with those in the rest of the region: Singaporeans celebrate the Muslim holiday season of Ramadan, same as other Muslim countries in Southeast Asia; likewise, the country throws one of the world’s most memorable Christmas and New Year festivals at the end of the year. For a more complete look, read our list of Singapore festivals to plan your trip around. What – and Where – Do I Eat in Singapore? Sure, you can spend a mint on Singapore’s many expensive restaurants, but there’s a reason this country’s one of Southeast Asia’s best cities for street food. The food courts, known as “hawker centers,” serve a wide variety of Asian dishes, despite their general shortage of ambiance and air conditioning. Singapore’s wide-ranging food reflects the multicultural mix of the Singaporean populace. Indian biryani stands jostle Western food booths and noodle stalls in most places. At any top Singapore hawker center, tourists mingle with working stiffs to breakfast on roti kaya, or stuff their faces with Cantonese, Hokkien, Indian, Malay, and "Western" food. Prices are low ($5 buys you a big meal) and you can even order a Tiger Beer to go with your meal for only a little extra. Is the Shopping Worth It? Yes, it is – go to any of Singapore’s top shopping districts and you’ll be joining in the nation’s unofficial national sport! There’s a sale on almost every month (the biggest being the Great Singapore Sale in August), and shoppers can get a lot done whether they’re looking through the shophouses in Chinatown or visiting the premium stores along Orchard Road. Tourists can get a refund on their purchases at the airport, allowing practically tax-free shopping for any traveler with a visitor pass.